No matter who your loved one has lost, communicating your love, comfort and wish to be there for the person is virtually impossible. A million cards, flowers, candles and other well-meant items may present themselves as options, but none really do your feelings justice. What to do? This is exactly why Captured Wishes was created. We find a way to capture the feelings you are having trouble expressing. 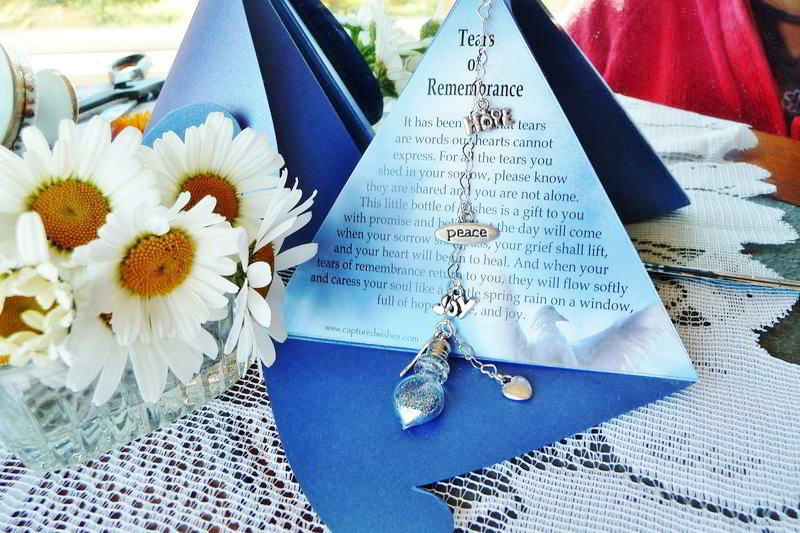 At this difficult time, Captured Wishes supplies the perfect tone for your sympathy gift. This gift comes in packaging of a unique design. The wish vessel arrives in a puffy triangle gift box, which transforms itself into a stand-alone verse card by simply flipping back the flaps (instructions are provided). You can sign your name, along with a brief note, anywhere on the flaps of this verse card. This vessel would make a wonderful group gift: you can collect signatures on all the flaps of the verse card. This design makes it easy to display the Wish vessel on a desk, mantlepiece, or window sill. Or it can be attached to a window or mirror with the provided suction cup. The vessel itself is in the shape of perfectly-shaped tear that has been shed. The picture of the dove in flight is symbolic of how the tears of sorrow will become gentle and softened from promise and hope of time passing.